Such a stunning composition. Well spotted and captured. Glad the retreat was fulfilling. I have no idea what/where you went, so I'll have to read back a few posts, but seeing the title of this one tells me all I need to know. I so agree with Susan. An absolutely stunning composition! Retreats are so wonderful for the soul! Yeah! Beautiful photo, and so wonderful to experience a retreat that is so perfect! Having participated in creative retreats in the past, I know that feeling of being filled up with excitement and joy at seeing the world in a new light. 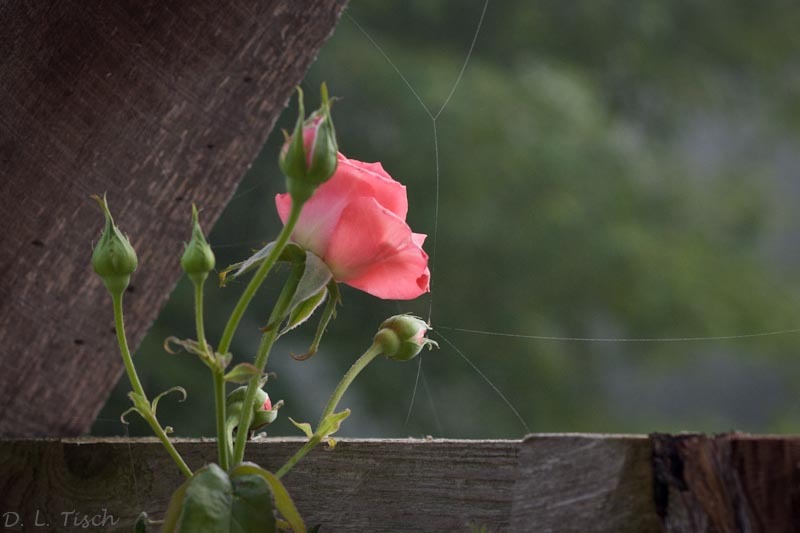 Your image perfectly captures that feeling – I love the way the fence and the web provide compositional support for this delicate flower, its soft pink shining in the light. Stunning! Hello. I'm Barbara from the "Practice" class. I'm so glad to be introduced to your work and am sending a link to a friend who is a photographer. I read through your July posts and came back to this one for all you found for yourself in this small scene. I love retreats and this sounds like a rich one that brought you to this reflection of your time there.